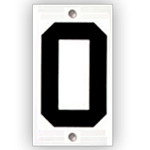 Number plates can be used to customize elevations for a particular application. Number plates measure 2-1/4 x 4 inches. Printed numbers measure 1-7/8 x 3 inches. Number Plates are sold per each.